It's Christmas time again & we're bombarded by the media with offers, gifts etc. One ad caught my eye yesterday with probably the most used QR codes ever in an ad. The advertiser is none other than DiGi's Christmas ad with a collage of QR codes forming a Yellow Man Santa. Before you judge that it's just another ad with exceptionally lots of QR codes, indeed you're wrong. The unique part of these QR codes is that each code is different, hence every scan directs you to a completely unique gift downloads or should I say offers. 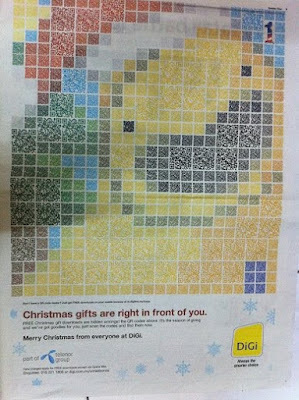 Way to go, DiGi & the agency who created this!